(Nanowerk News) Researchers have used lasers to create the first practical macroscopic yarns from boron nitride fibers, opening the door for an array of applications, from radiation-shielded spacecraft to stronger body armor, according to a just-published study. Researchers at NASA's Langley Research Center, the Department of Energy's Thomas Jefferson National Accelerator Facility and the National Institute of Aerospace created a new technique to synthesize high-quality boron-nitride nanotubes (BNNTs). They are highly crystalline and have a small diameter. They also structurally contain few walls and are very long. Boron nitride is the white material found in clown make-up and face powder. "Other labs can make really good nanotubes that are are short or really crummy ones that are long. We've developed a technique that makes really good ones that are really long," said Mike Smith, a staff scientist at NASA's Langley Research Center. The synthesis technique, called the pressurized vapor/condenser (PVC) method, was developed with Jefferson Lab's Free-Electron Laser and later perfected using a commercial welding laser. In this technique, the laser beam strikes a target inside a chamber filled with nitrogen gas. The beam vaporizes the target, forming a plume of boron gas. A condenser, a cooled metal wire, is inserted into the boron plume. The condenser cools the boron vapor as it passes by, causing liquid boron droplets to form. These droplets combine with the nitrogen to self-assemble into BNNTs. 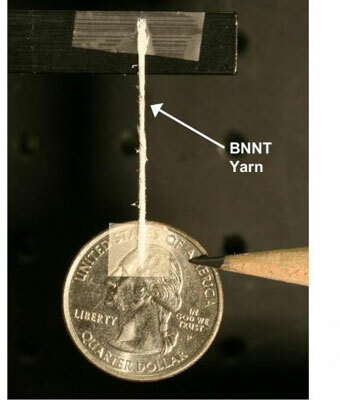 A yarn spun of boron-nitride nanotubes suspends a quarter. The nanotubes in this yarn were produced with a new technique discovered by researchers at NASA's Langley Research Center, the Department of Energy's Thomas Jefferson National Accelerator Facility and the National Institute of Aerospace. The nanotubes are highly crystalline and have a small diameter. They also structurally contain few walls and are very long. Researchers used the PVC method to produce the first high-quality BNNTs that are long enough to be spun into macroscopic yarn, in this case centimeters long. A cotton-like mass of nanotubes was finger-twisted into a yarn about one millimeter wide, indicating that the nanotubes themselves are about one millimeter long. "They're big and fluffy, textile-like," said Kevin Jordan, a staff electrical engineer at Jefferson Lab. "This means that you can use commercial textile manufacturing and handling techniques to blend them into things like body armor and solar cells and other applications." Transmission electron microscope images show that the nanotubes are very narrow, averaging a few microns in diameter. TEM images also revealed that the BNNTs tended to be few-walled, most commonly with two-five walls, although single-wall nanotubes were also present. Each wall is a layer of material, and fewer-walled nanotubes are the most sought after. The researchers say the next step is to test the properties of the new boron-nitride nanotubes to determine the best potential uses for the new material. They are also attempting to improve and scale up the production process. "Theory says these nanotubes have energy applications, medical applications and, obviously, aerospace applications," said Jordan. Smith agreed, "Some of these things are going to be dead ends and some are going to be worth pursuing, but we won't know until we get material in people's hands." The research will be published in the December 16 issue of the journal Nanotechnology. The article is available for a short time online. It will also be presented at the 2009 Materials Research Society Fall Meeting on December 3.